At the end of last winter, I bought some pretty yarn. It was blue and had flecks of other colors and looked a bit iridescent in the right light. I cast on some stitches, but over the spring and summer months I worked on smaller projects that were easier to transport. A short time ago, my neck decided that it was in great need of a scarf. I started to stress knit at night and bit by bit my scarf was coming together. K3P3 was the pattern of my choice. Over and over again I did this until I ran out of three skeins of my fluffy blue goodness. Finally it was finished! Then it was time to put on the scarf. I have to admit, I had no idea how much warmer I would feel wearing this. The afternoon I completed my project, I wore it around the house and was in heaven. Since I finished it late last week, I have worn it to Disney on Ice, shopping with TechyDad, and to pick up the kids from school. It has made the world of difference as the temperature continues to drop. So now I am working on another scarf for inside the house. With any luck, I will get to a store to have my mother pick out some yarn since I promised to make her one next. Do you like to wear a scarf in the winter? I was not a fan before this, but I think I have changed my tune! I so wish I knew how to knit! Love the way it turned out! I wear scarves and mittens always in the winter. then I did a Fun Fur scarf for Meg which took a day- easy and fun to make. 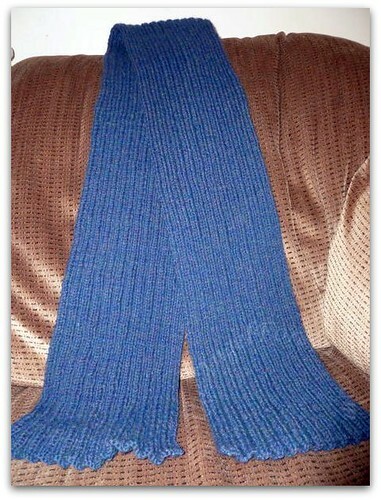 Now I am working on a 6 ft skinny scarf to give to my sis for Christmas. 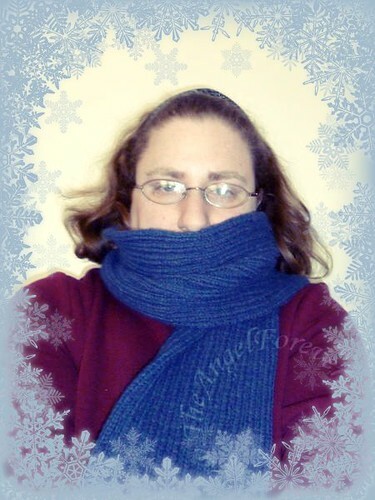 My favorite scarf is one that I knit myself with the help of magic elves. 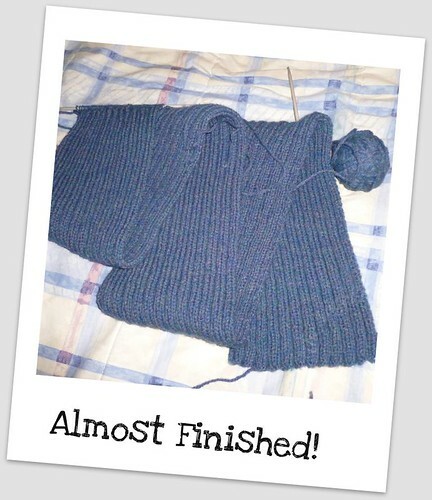 It was my first, and last, knitting project. Every day I’d work on about an inch of scarf, but when I woke up in the morning that inch turned into a foot. That went of for nearly a week, until I had the longest, most wonderful scarf ever. I have a ton of pretty hand knit scarfs from my mom and Godmother but they are mainly decorative and pretty. When I need to be warm, I rely on the cheapo fleece ones I got at Old Navy one year for a buck a piece. I am definitely a big scarf fan! I love the blue you picked out.